Achilles Tendonitis is an inflammation of your Achilles tendon, the largest one in the human body. Your Achilles tendon connects your calf muscles to the heel bone, and it’s obvious that we all use it in a very active way each time we walk, or when we are actively doing sports. This is why Achilles Tendonitis is not only painful, it can also seriously impact your life and immobilise you for a while. At The Foot Clinic Perth (Cottesloe), our team of experienced podiatrists will give you a clear, detailed diagnosis, and treatment options depending on your personal situation. Achilles tendonitis can be caused by the intensity of your workouts. In other words, over-using your feet in an intense training schedule. Typical situations that cause Achilles Tendonitis are incidents where you hurt yourself when you change your running surface (from running on grass, to running on concrete for example). If you have a collapsed arch, and have flat feet, then you will put more pressure on the tendon as well, potentially causing an inflammation. Having too much arch can also cause the problem, when your foot arch is high, and your Achilles tendon is tight. 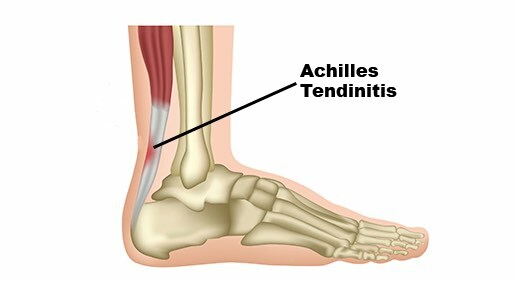 Achilles tendonitis can also be caused by tight muscles in other areas (hamstring and calf). Physitrack is an integrated exercise program used to prescribe and to track your exercises. It uses an online library of over 900 clearly narrated exercise videos. A first important step to get rid of pain and inflammation is to find out exactly what causes your problem. At The Foot Clinic in Cottesloe, we will always give you a clear diagnosis, and an overview of treatment options. The focus is on reducing inflammation, so you can feel more comfortable. Then, we will explain a range of treatments and technologies to support your recovery. Once we have reduced the inflammation, we will help you with the most appropriate treatment option, so you can get back on your feet and fully restore your mobility. 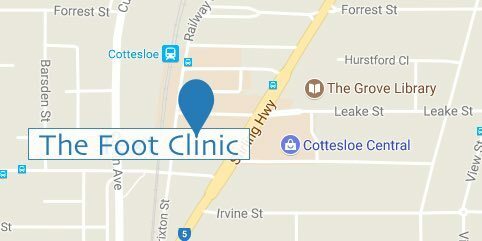 At The Foot Clinic Perth (Cottesloe) we combine excellent customer service in general podiatry, with a particular expertise in the biomechanics of the body. Different areas of your feet, legs, knees and hip, all work together to guarantee normal function. Using our advanced measurement systems, we assess the impact of a condition on your overall motion. Having that overview helps us look at the bigger picture, and build better bodies, from the feet up. Patients and customers choose us because of our friendly service, our convenient location at Cottesloe Central, our use of the latest innovative technology and a large expertise in working with our patients, including professional sports people and athletes. Contact us today to help you with Achilles tendonitis or with any other podiatry treatment you might need.